Several weeks ago, a reader, Brian S., reached out with a question. 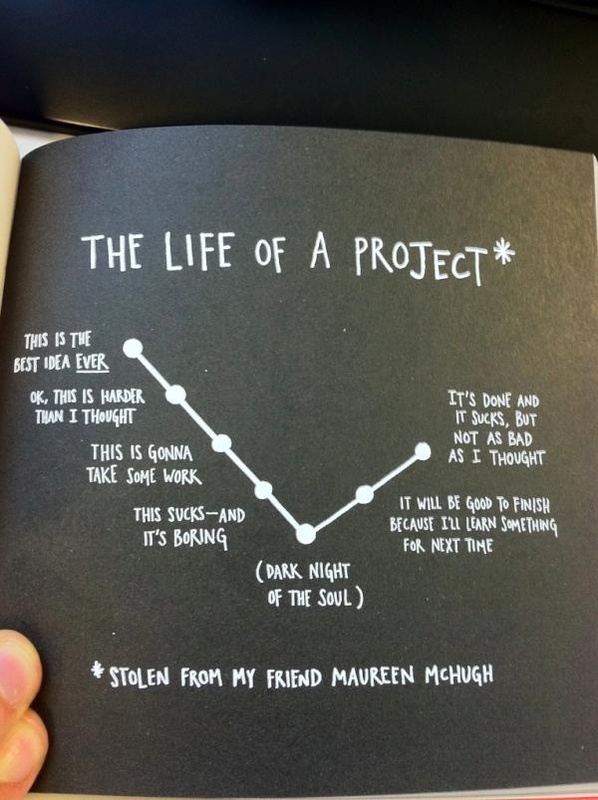 He wanted to know if there was a process for determining when it was time to quit a project. I’ve written on this topic several times before; I thought I knew what to say. But as I started to respond to his email, I found myself running up against several unanswered questions. My advice was dependent upon his particular situation. So I began drafting a reply full of questions about the kind of project, how long he’d been working on it, why he wanted to quit, etc. But before I pressed send, I took one more look at the wording of his question. It wasn’t about quitting some specific thing, it was about a process for quitting. I deleted my email and began to consider the topic more systematically. What I found was that, even though I don’t always follow my own advice, there is a process when it comes to quitting. It just involves asking yourself a few questions and following the flowchart. Is the Project Finite or Long-Term? The first, and most obvious aspect of any project is whether it has a finite ending or is longer-term and continuous. Writing a book or sewing a pillow can be “finished.” Once you’ve created the thing, you’re done. (Woohoo!) Writing a weekly blog or releasing a weekly podcast, on the other hand, lacks a specified end point. It feels good to get one more piece out into the world, but by the time you do, you’ve already got to think about the next one. If you want to quit and the project is finite, figure out how far you are from finishing. If you’re close (66% or more of the way there), then put your head down and rock it out. You’ll feel good having done it and won’t feel like you gave up when you were close. If the project is finite but you’re far from the end, or if the project is longer-term, then proceed to step two. Before you make a final decision, figure out why you feel that way. I’ll be the first to admit that “too hard” is a bit vague for a systematic process, but what I mean in this context is that you lack the skills or abilities needed to finish something. If you’re an artist with plans to create a comic book, you may have rushed into the process only to discover that you don’t know how to string two sentences together. In this scenario, the answer isn’t to quit. Instead, find a writing partner to help you or take some time off from the project to develop those skills yourself. Ok, time for some real talk: do you actually not have time? Or are you just saying you don’t have time? If it’s the former, then remember: personal projects aren’t a race. They’re supposed to be fun. You can tackle it at your own pace. So don’t quit—take it slow. Writing an hour a week and finishing your book over two years is better than never writing one at all. If you’re just saying you don’t have time, then make some more. I’m sure there’s an hour in your week where you could stay up a little later, wake up a little earlier, or skip a Netflix session to make some progress. Now we’re getting into potential quitting territory. The feeling when you start a new project is unbeatable—you’re inspired, energized, and can’t wait to get to work. But as time passes, as the idea meets reality, it gets harder and harder to work on. You start to lose some of that fire that got you going in the first place. Rather than quitting, remember that you can always take a break. Put it away for a week, month, or year. Try something else. Learn a new skill. Meet new people. Then come back—you might find that you’re reinspired. If not, then you have permission to quit. Maybe you started a blog, and despite posting some great writing, your only readers are your mom and your spouse. Or maybe you launched a t-shirt business and no one’s buying. You might feel like it’s not worth it anymore—here you are pouring all this time and energy (and maybe even money) into something, and you’re not seeing any returns. Ask yourself how long you’ve been at it and how hard you’ve been working. They say it takes twenty years to make an overnight success, and while I won’t force you to keep going for that long, I would recommend at least a year of serious effort before walking away. If, though, you can say you’ve given a project your all for a reasonable amount of time and aren’t seeing results, you have permission to quit. I am a big believer in quitting. As Brian S. noted in a follow up email, “saying no to something is just an opportunity to say yes to something else.” But it isn’t a decision to be taken lightly. You’ll often feel like you want to quit when you’re in the middle of a difficult project (aka the dark night of the soul). But if you always give up, if you never power through the pain of creating, you’ll never complete anything of consequence.